These boots almost didn’t make it. I took them to the cobbler who basically laughed at me and told me “Yeah right, we can’t replace vintage boot liners.” Um, what? Isn’t that what you do? I thought to myself, of course. I’m not one to tell anyone how to do their job. So I grumpily googled from the time I left the shop until I got my lunch at Panera, only to realize he wasn’t being a jerk. He was right. Apparently, insoles or liners in vintage boots are nearly impossible to replace. Especially if they’re the crumbled or deteriorated (which is affectionately known as “Devil Dust” in case you were wondering.) This is because the glues and materials used in the 60s-80s are hazardous and most of the time toxic. Awesome. So I took my toxic, hazardous boots home and to try to replace them myself. Yeah, that was a big fat fail. I was about to give up and just wear my non-vintage boots for today’s post when I found some old Dr. Scholl’s Air Pillow liners in our closet. They are the type that you cut to fit, so I cut them a bit smaller than the size of the boot, stuck them in, and magically, it worked. And speaking of not dull, Seattle ladies and gents, have you heard about Seattle Goodwill’s Glitter Sale? I may have gotten a sneak peak this week of what’s for sale. I’m dying to nab this Marc by Marc Jacobs Dress (it was totally my size too, insert heart eyes emoji) and some Tory Burch Revas in olive for $13. Yes, $13. Insane. 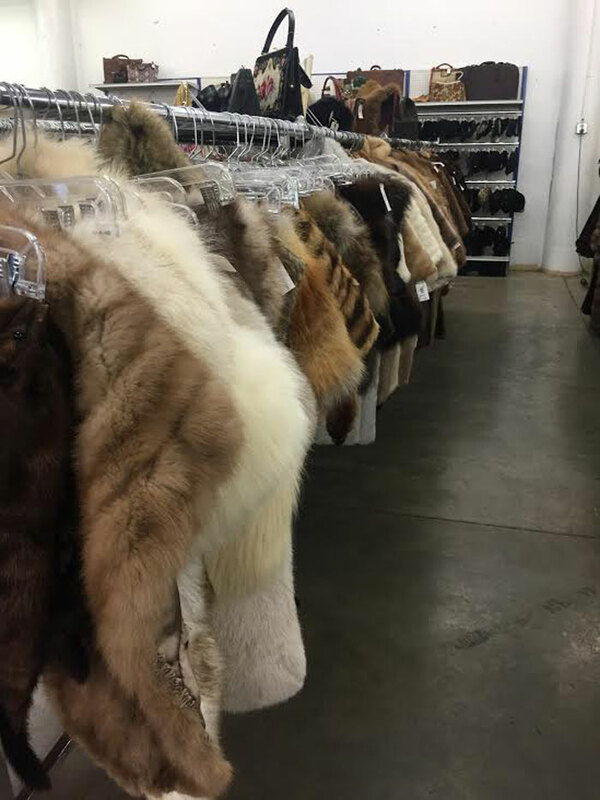 They also have a tonnnnn of vintage furs (real and faux, pick your poison) in nearly every shape and color. I also am a big fan of their clutches and bags, especially the vintage pieces. Anyways, the sale starts bright and early at 9am on Saturday. I’ve been told that people camp out, so get there at whatever time you’re comfortable with, get a number, sign up for text alerts, and enjoy the food trucks or grab some breakfast while you wait. That’s exactly what I’m planning on doing. 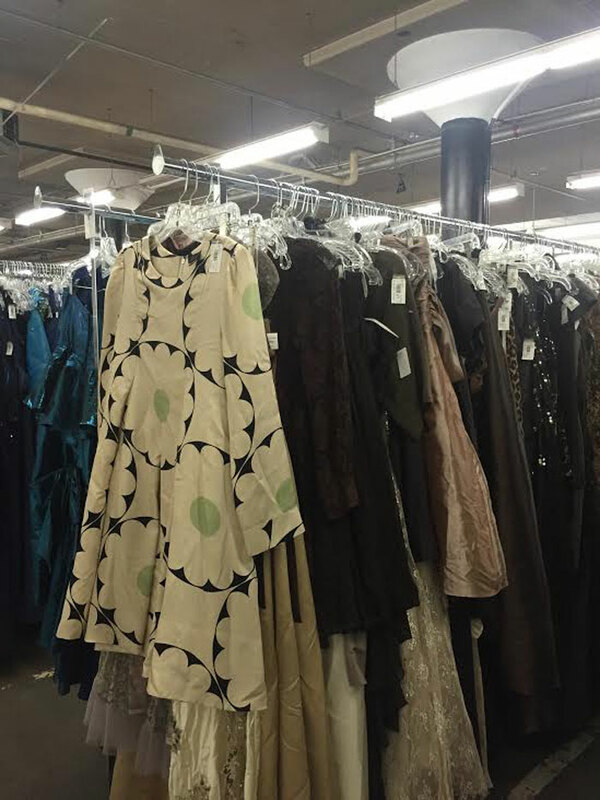 Seattle Goodwill Glitter Sale, 1400 S Lane St, Saturday 9am-6pm, Sunday 9am-6pm. See you there! 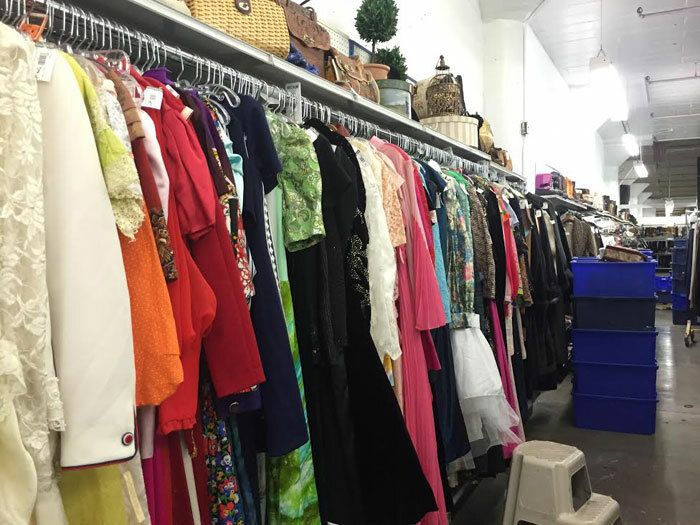 Have you ever found any vintage treasures while thrift shopping? I’d love to hear about them! That looks like an amazing store! I’ve never seen a Goodwill that nice before. Safe to say, I would be there A LOT if it was close by :) Happy shopping! Wow! Your Goodwill is SUPER nice! The ones around here don’t look anything like that. lol! Those boots are super cute. I’m glad you were able to fix them! I had no idea about the liners either. That’s crazy! I know, right? I’ve been buying vintage shoes off and on for years and had no idea! Thanks Julie! Wow….that is the biggest Goodwill I have ever seen. Also designers in the place? Not around here haha. I have however been able to find some good stuff in the ones around here so they’re not a bust by any means. I love your look!! My trick is to always visit thrift stores near the “wealthy” parts of town. Higher chance of finding some great designer gems that way! Thanks Kels! I really need to go to Goodwill! Wow! Of course, ours probably isn’t that nice! Wow, that is one heck of a Goodwill! And I love the outfit that you put together. Those adorable boots were so worth the hassle. I used to be really into thrift shopping when I was in high school, but the older I get, the less I enjoy the “thrill of the hunt.” I have scored some real gems at Buffalo Exchange, though, like a Free People top for $15 and a gorgeous Banana Republic leather jacket for $50 (sadly destroyed by a puppy last year). Haha, yeah, the Glitter Sale was pretty incredible. I’ve never seen anything quite like it. And thanks! I thought so too :) I actually have yet to shop a Buffalo Exchange. I’ll have to add it to my list of things to visit soon! I’ve never Goodwill shopped for anything other than children’s books. But I’m glad those boots didn’t make you die. 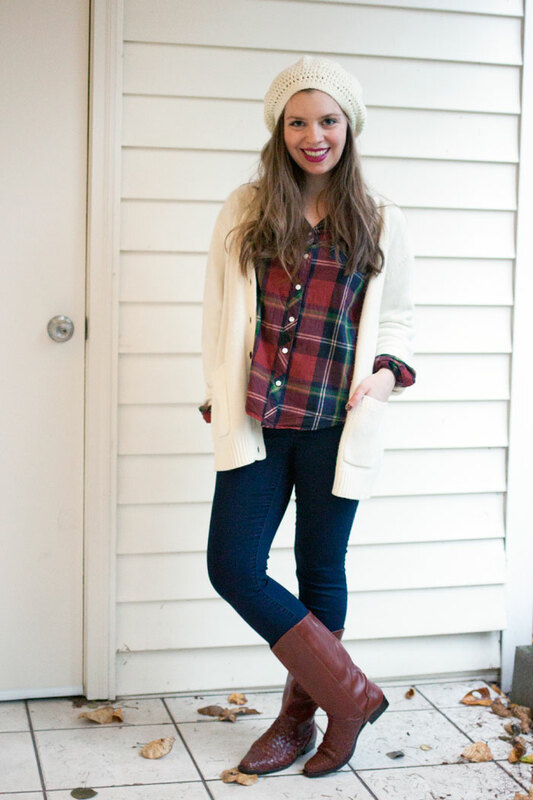 I always looks so horrible in oversized sweaters, but you style this so well! I totally love it! Thirfting is SO much fun! Agreed, it’s one of my favorite ways to shop! Yay, love finding fellow Seattle bloggers! Thrifting is one of my favorites, and I’m sure you could find a ton of UW gear! That outfit is way cute! I would totally wear it! I need to check out Goodwill or the Junior League warehouse the next time I am in that area! You’ve inspired me. Thanks, Sarah! 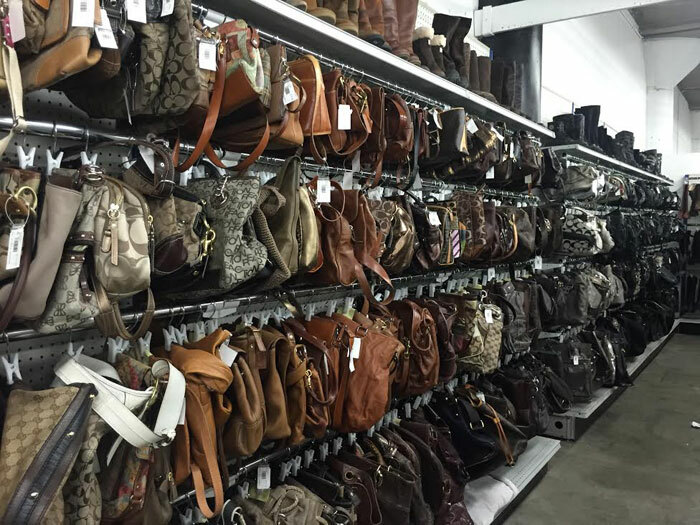 I’m jealous you have a Junior League Warehouse… I bet they have a great selection! Happy to inspire you, thrift shopping is my favorite! 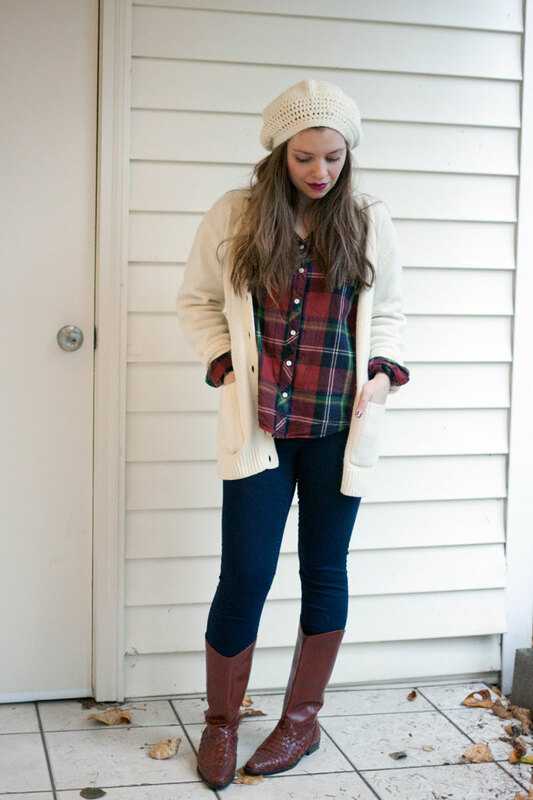 Such a great fall look- love the plaid with the sweater. Can’t believe you got it at Goodwill- that’s awesome!